A century-old dam along the North Branch of the Chicago River is being demolished as part of a series of restoration efforts by the U.S. Army Corps of Engineers, Chicago District (USACE), Metropolitan Water Reclamation District of Greater Chicago (MWRD), and Chicago Park District to allow upstream fish migration and improve navigation and surroundings for boaters. The North Branch Dam, which meets at the confluence of the North Branch of the Chicago River and North Shore Channel between Foster Avenue to the north and Argyle Street to the south, will be transformed into a more accessible waterway for an increasing amount of fish, kayakers and visitors to River Park. Funding will be provided by USACE, the MWRD and the Chicago Park District. "When the MWRD first built the North Branch Dam in 1910, the District could not have imagined the new opportunities that awaited us more than 100 years later," said MWRD President Mariyana Spyropoulos. "Due to water quality improvements, there is an increasing amount of biodiversity in and along our waterways and soaring recreation and economic investment along the riverfront. All of this has sparked the upgrades that are currently being made." In support of the USACE's River Riparian and Habitat Project, work in and along the waterways will be broken down into phases, starting with the restoration of approximately one acre of stream bed. The North Branch Dam and other concrete within the channel will be removed and riffles, step pools, cobbles, gravels and sands will be installed. Anticipated future work will restore 29 acres of savannah habitat, 14 acres of riverbank and five acres of aquatic beds by removing invasive species and establishing native bank vegetation. "We've worked with the MWRD on a number of projects in the past and we're happy to be working with them again to help make the Chicago River a better resource for Chicagoans and wildlife. 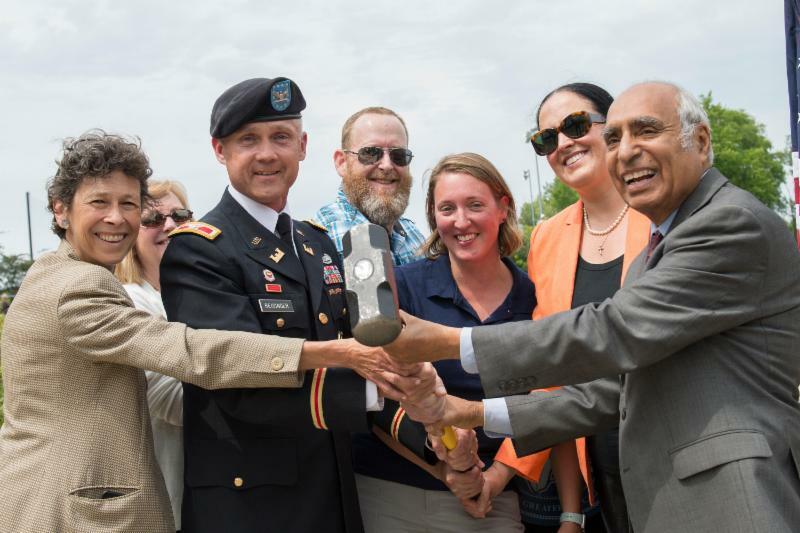 I think it's great that three different agencies with complementary missions at citywide, region wide, and nationwide scales can come together to collaborate on a project to improve water quality," said Jason Zylka, Ecologist with the U.S. Army Corps of Engineers, Chicago District. Shortly after reversing the flow of the Chicago River, the MWRD constructed the dam as part of the agency's construction of the North Shore Channel. The new channel provided drainage to the marshy areas north of the city and directed lake water into the North Branch of the Chicago River for dilution. The dam was initially required to protect and preserve the natural channel of the North Branch upstream of the channel. Improvements to the North Branch downstream of Lawrence Avenue had lowered the water level a few feet, and a dam could prevent erosion. Modifications were made to the overflow wall of the dam in the 1920s and 1960s to open up parts of the wall to speed up low flows and eliminate tree limbs and other debris that plugged holes in the wall. Recognizing the importance of designating property along the waterways for public recreational uses or green space that aids in water quality improvements and stormwater management, the MWRD today leases the River Park area to the Chicago Park District for a nominal fee to turn the waterways into an inclusive, accessible amenity. The 30-acre River Park offers access to wildlife habitat, fishing and a canoe launch, in addition to a swimming pool, an interactive water playground in summer months and an artificial turf soccer field and running track, a soft-surface playground, seven tennis courts and two baseball fields. 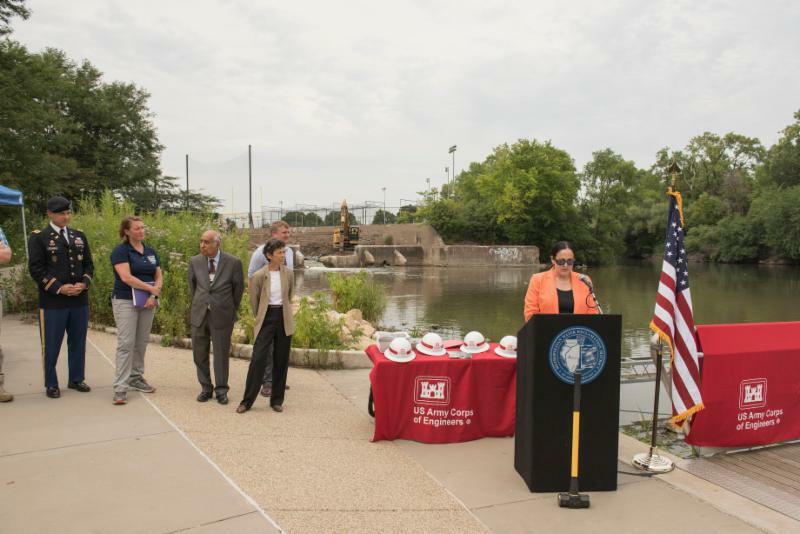 "Enhancement of one of Chicago's most iconic waterways is making strides with the replacement of the dam and habitat improvement at River Park," said Chicago Park District General Superintendent and CEO, Michael P. Kelly. "Upon its completion that section of the Chicago River will not only be more aesthetically pleasing, but it will also allow for passage of diverse fish species and paddle crafts upstream as well as create new recreational opportunities for visitors and area residents to enjoy." The North Branch Dam, known to many as Chicago's only "waterfall," has become an attraction to many visitors. By replacing it with a series of riffle pools, the North Branch will stream over rocks, and instead of a single four-foot drop at the dam, the restoration work will allow fish to swim upstream. The number of fish species found in the Chicago Area Waterway System (CAWS) has drastically increased since the 1970s when monitoring of the fish population first began. From 10 known species in 1974, MWRD aquatic biologists have documented 76 total species, including 59 that have been found in the CAWS since 2000. But fish surveys have also documented less biodiversity north of the dam so the Illinois Department of Natural Resources and Friends of the Chicago River encouraged improving access and stabilizing the streambanks. "Eliminating the North Branch Dam is the natural next step in transforming the Chicago River system into a healthy accessible resource," said Margaret Frisbie, executive director, Friends of the Chicago River. "Its removal will open up another 20 miles of the river for fish and make paddling safer. Friends has been advocating for four dams to be removed which will reconnect an additional 55 miles and provide enormous environmental benefit. The North Branch Dam is the second of the four to be removed." L-R: MWRD Commissioner Debra Shore; Mary Ann Levar, Congressman Mike Quigley's office; U.S. Army Corps of Engineers Col. Aaron Reisinger, Chicago District; John Quail, Friends of Chicago River; Kathy Breitenbach, Chicago Park District; MWRD President Mariyana Spyropoulos and MWRD Commissioner Frank Avila hold a sledgehammer.